At the auspicious time 12.43 p.m. on Monday May 22, 1972, Ceylon became the 'Republic of Sri Lanka' severing a 157 years old link with the British crown. This transition from a dominion to a republic took place at the Navarangahala on that day. Although Sri Lanka cut its Constitutional connection with Britain it was to remain within the Commonwealth. The Constituent Assembly met in the morning at nine on May 22, 1972 to vote on the Constitution. 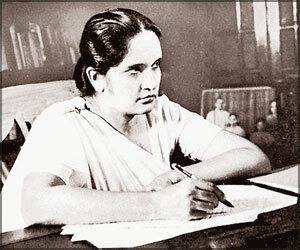 A few minutes after the President of the Constituent Assembly Stanley Tillekeratne put his seal to the new Constitution, he called on the Prime Minister Mrs. Bandaranaike to take her oath of allegiance. The oath that Mrs. Bandaranaike took at 12.56 p.m. on May 22, 1972 was: "I do solemnly declare and affirm that I will be faithful and bear true allegiance to the Republic of Sri Lanka, that I will uphold the Constitution of Sri Lanka and shall faithfully perform the duties and functions of the office of Prime Minister in accordance with the Constitution and with the law." While the ceremonies at the Navarangahala were in progress there were religious and cultural ceremonies throughout the country. The Queen's House become the President's House from that date. Queen Elizabeth the Second sent a message to the President on the occasion of the birth of the Republic. Dr. Colvin R. De Silva was the architect of the new Constitution. Mr. Stanley Tillekeratne signed the adoption of the new Constitution. He said that May 22, 1972 goes down to history and marks a new era in the political development of the country. On this historic day, he said, "We take our rightful place in the committee of nations as free, independent and Sovereign Republic, after centuries of subjugation under colonial rule. In 1815 our subjugation to foreign rule was complete with the fall of the Kandyan Kingdom. The political evolution of the country in the twentieth Century saw a few significant landmarks. The Donoughmore Constitution of 1931 conceded a limited measure of internal self-government which was improved on by the Soulbury Constitution in 1947 which granted self-government in all matters of internal civil administration Dominion status was granted in 1948. Thus in 1922 (May 22) Ceylon became the 'Republic of Sri Lanka'.